Horses Abe and Pete, totaling 5,500 pounds together, pulled 19,000 pounds for a distance of 18 feet and 8 inches, winning first place in the Western National Horse Pull Championship in Denver, Colo. One of the horses belongs to Brazil resident A.J. Thompson, and the other belongs to his friend who he teamed up with. One local man recently set a new record. Well, actually his horses did. A.J. Thompson, Brazil, has been attending horse pulls since he was 10-years-old with his father. After raising his own family, Thompson started competing in horse pulls himself. He's been competing now for almost 30 years. This year alone, Thompson competed in 25-30 horse pulls, attending several out-of-state competitions in Ohio, Kentucky and Illinois, among others. 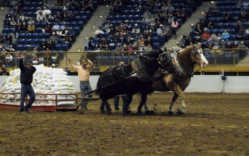 Most recently, Thompson competed in the heavy weight contest at the Western National Horse Pull Championship in Denver, Colo. He competed with two teams of two horses -- three of which are his horses and one, which belongs to a friend. The horses -- Abe, a 2,455-pound horse and Pete, the 3,045-pound horse that is owned by Thompson's friend -- pulled 18 feet and 8 inches, winning first place and setting a new record for 19,000 pounds. The second team made up of Chuck, a 2,360-pound horse, and Sam, a 2,400-pound horse, came in second place by pulling 13 feet and 6 inches. Thompson won $2,500 for first place and $1,600 for second place. "It's quite an accomplishment to win first, let alone first and second," Thompson said, who described himself as proud. He said the horses did outstanding and pulled all they could. He explained that the crowd of 10,000 roared during his first place pull. Thompson's teams competed against 10 other teams from places like Missouri, Wisconsin, Utah, Iowa and Pennsylvania. "It's probably the biggest competition in the United States for horse pulling," Thompson said. Thompson, a timber-buyer, his wife and others spent a week in Colorado, staying at a local 20,000-acre ranch. They said they enjoyed the rodeos, wagon shows and other livestock shows during their time at the coliseum. "It was the best rodeo I've ever seen," Thompson said. "The weather was awesome too." The Thompson's traveled 1, 059 miles to the horse pull, and they agreed the drive home was much shorter after winning.